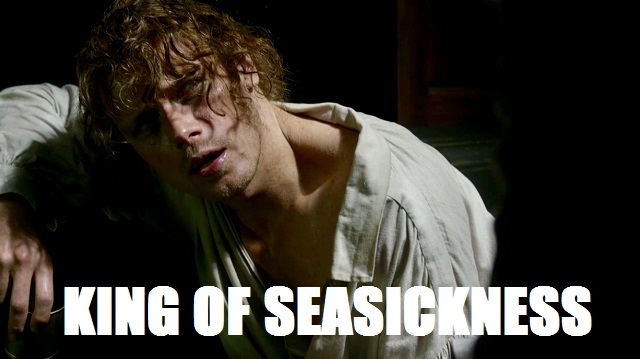 Acupuncture and typhoid and seasickness—oh, my! 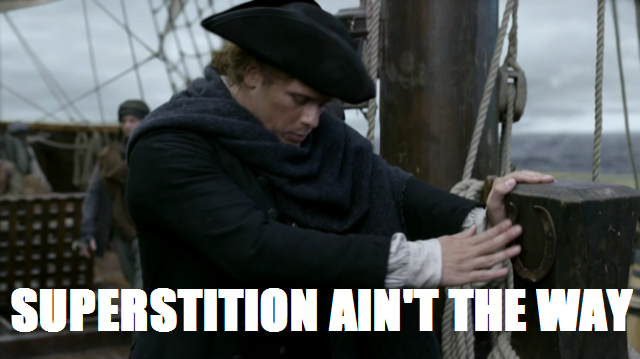 Outlander has finally arrived at the voyage portion of Voyager, and Episode 309, “The Doldrums,” is setting a course for adventure! 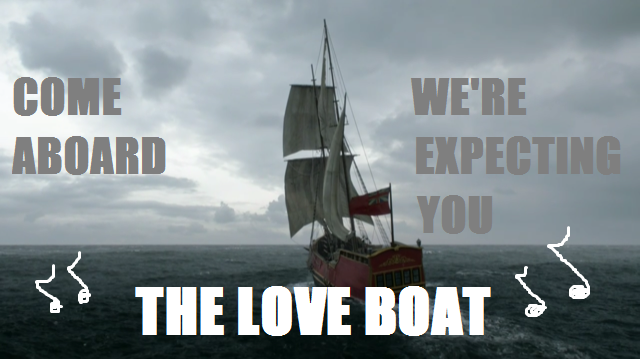 I can’t be the only one who has been singing the theme to The Love Boat all week now, can I? 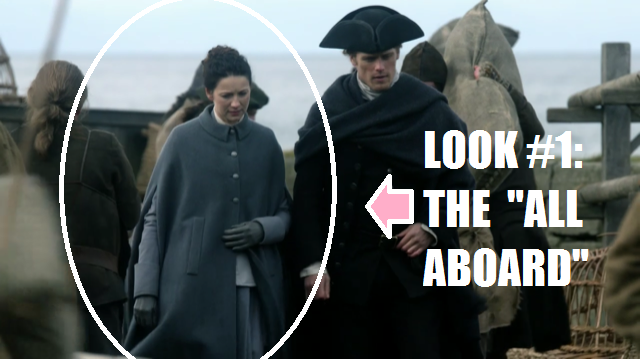 Let’s climb aboard and discuss all of the seafaring shenanigans in this week’s Outlander Superlatives! Is Mr. Willoughby the 18th century’s Lin-Manuel Miranda? Not only is he a wordsmith, he knows how to capture an audience! 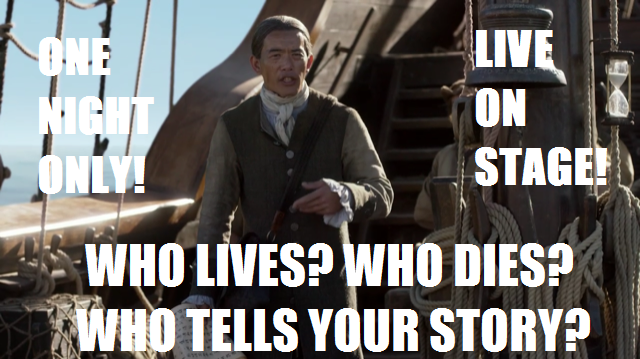 Mr. Willoughby—or Yi Tien Cho—is the ultimate hero of this episode. 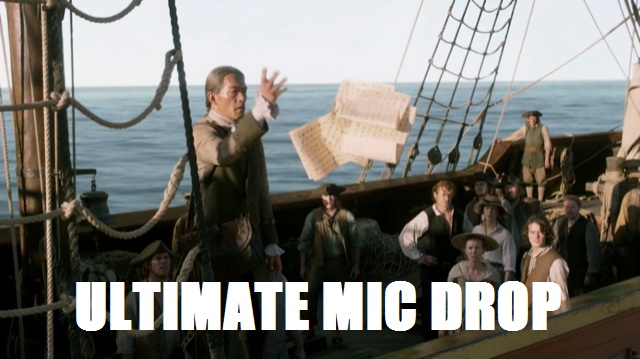 He prevents an outright mutiny by performing his one-man show and then he scatters his life story to the newly found wind like he’s dropping a mic. 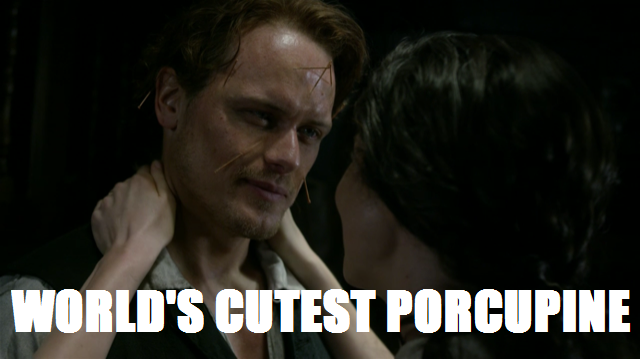 Aside from that, let’s not forget that he’s the one who helps Jamie with his seasickness, preventing some pretty—er—damaging health issues and giving us an adorable porcupine to look at to boot. These peeps and their superstition. 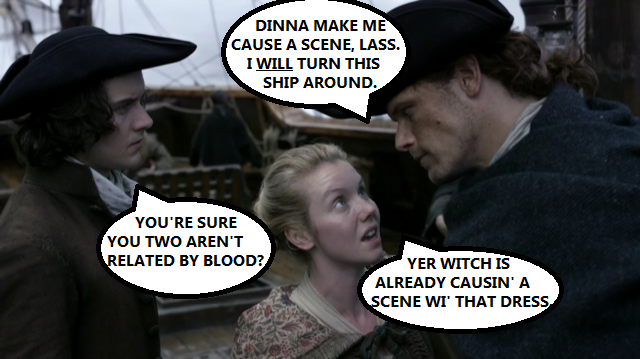 It’s one thing if you, like, don’t want to change your kilt before the big shinty game, but it’s quite another when you think women and gingers on board a ship are bad luck! I don’t know about you, but I don’t want to be on any boat that doesn’t welcome this guy. Oh, and I also don’t want to be on any boat that’s willing to throw someone overboard for not touching a horseshoe. That and the ginger/women thing. Oh, James. You’re really not invincible, are you? 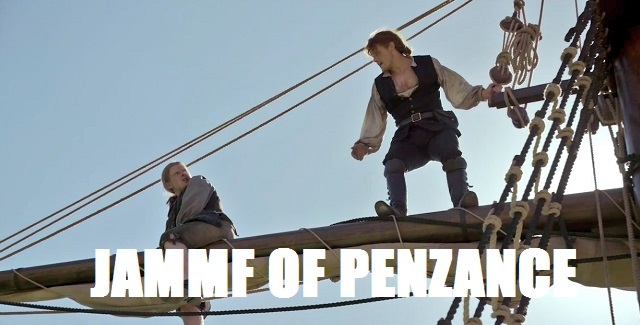 You can be beaten, flogged, imprisoned, tortured, shot, and sliced through with a bayonet and you’re like, “Eh, #MondayProblems.” But when you set foot on a ship, we realize that, hey, the King of Men is actually human! 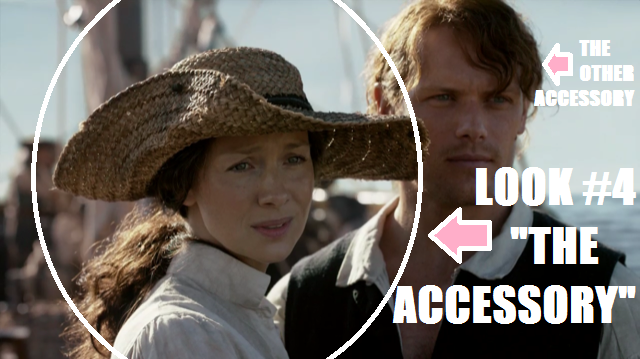 Never change, JAMMF. That vulnerability only makes you more lovable. Step aside, Romeo and Juliet. Hold on, Tony and Maria. 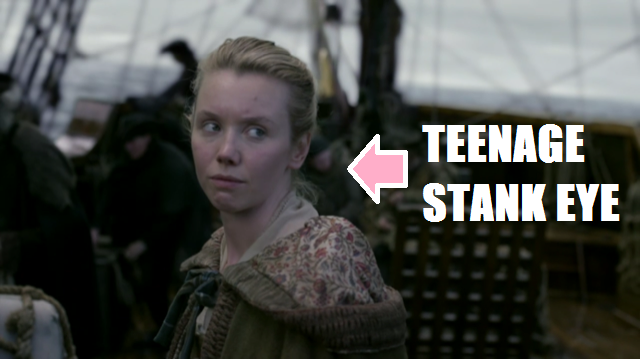 There’s a new pair of star-crossed lovers in town! Marsali has attitude by the bundle and I kind of love it. 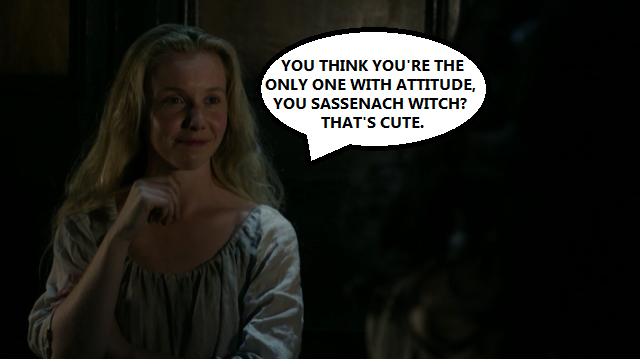 Our beloved Sassenach is always giving so much sass to everyone, it’s kind of fun to see her get a taste of her own medicine. Ah, teenagers. 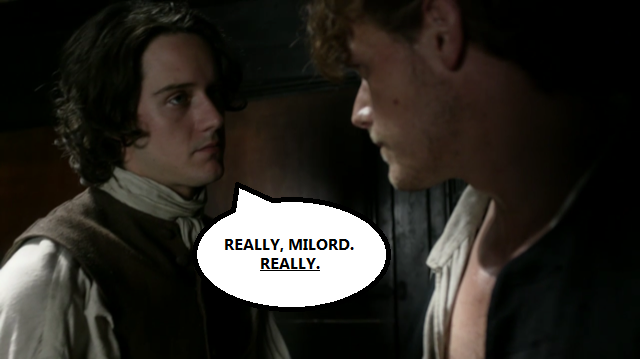 Am I right, JAMMF? 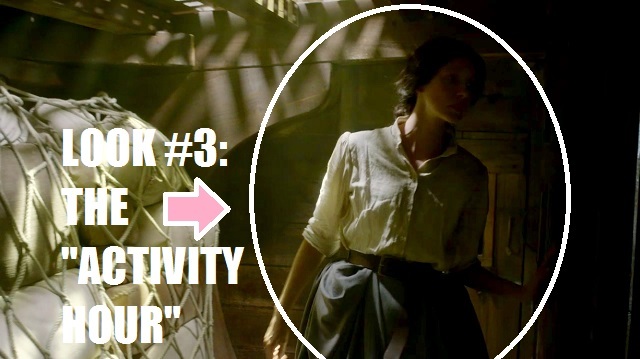 Claire must have read one of those Glamour articles about wearing one outfit five ways, because she is really making the most of her homemade batsuit! 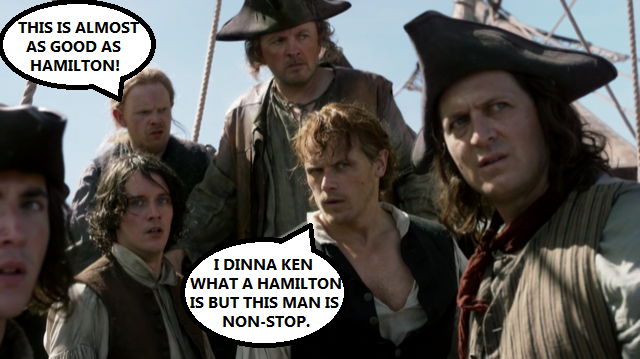 If there’s one thing hotter than JAMMF in the middle of a rescue mission, it’s JAMMF in the middle of a rescue mission dressed as a cast member of Pirates of Penzance. 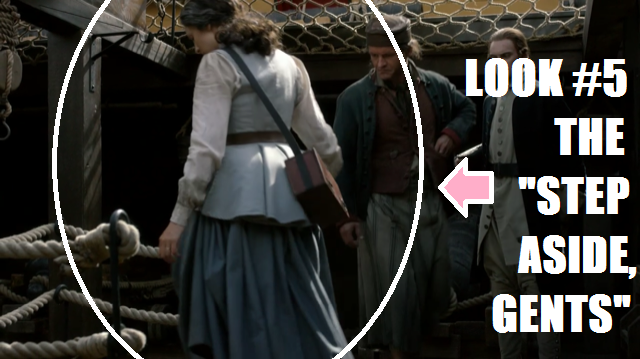 Does this look like a man who was barfing his guts out on the high seas only weeks earlier? Now he’s scaling ropes and teetering on whosey-whats-its (I’m very up on my nautical terms) to talk his mate down off of the ledge. 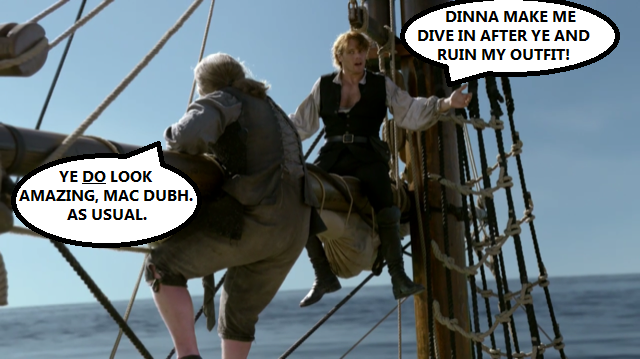 Because that’s what Mac Dubh does. 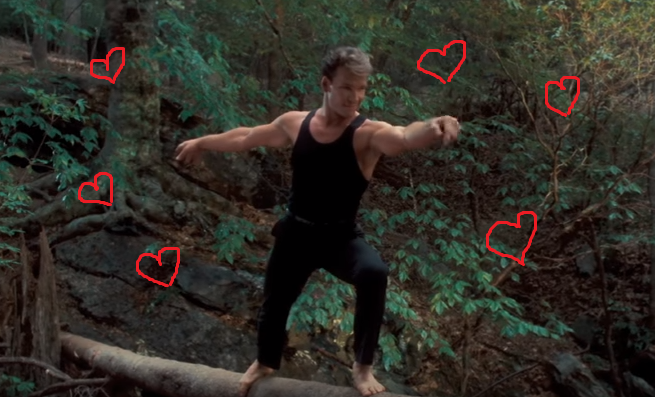 Also, anything that reminds me of Johnny Castle on the log is a-okay in my book. 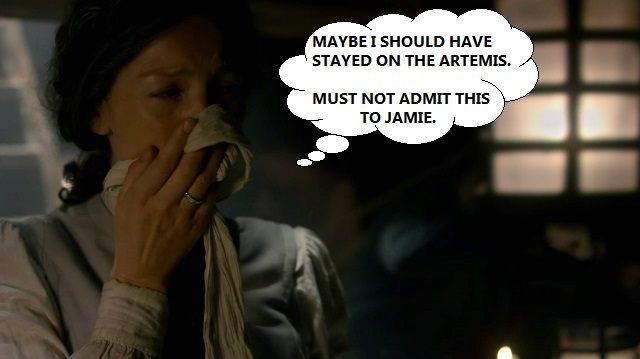 And the worst part about this brazen move, Claire? Your versatile skirt totally contaminated now with all of the human waste you had to sludge through! 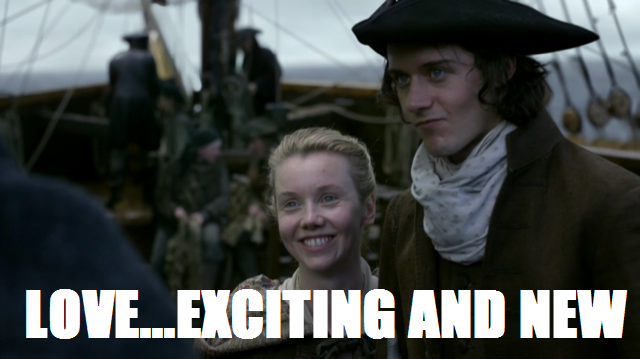 So what say you, my fellow Outlandish passengers? Would you buy a ticket to Mr. Willoughby’s show? Are you ready to keep rocking the boat in “Heaven and Earth”? 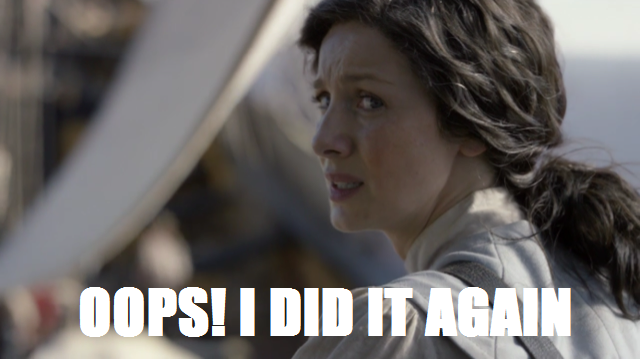 CAN YOU BELIEVE THERE ARE ONLY FOUR EPISODES LEFT? Let me know in the comments! 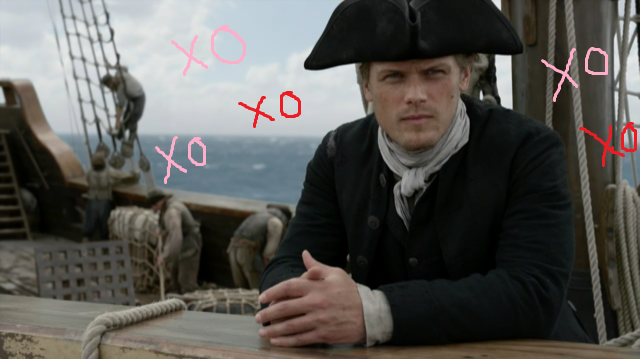 And I hope you’ll follow me on Facebook and Twitter so you don’t miss any of the JAMMF-infused, Book Perfumey fun. “I left my house and came to a place where the golden words of my poems are taken as the clucking of hens and my brushstrokes as their scratchings. For the love of woman, I am come to a place where no woman is worthy of love. To a place where woman are coarse and rank as bears. Creatures of no grace, and these women disdain me as a yellow worm, so that even the lowest of whores will not lie with me”. Bitter and racist much? 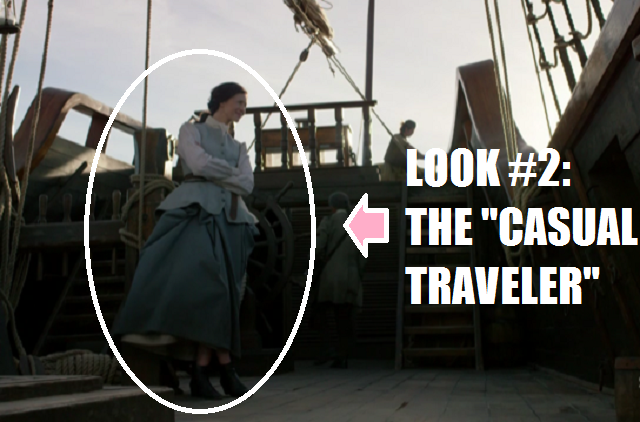 And everyone on board the ship was enthralled rather than take umbrage at this foreigner dissing their women? If Jamie had called Chinese women “coarse and rank as bears”, would he have been given the praise by viewers that they gave Yi Tien Cho/Willoughby?